A black and white photograph of a veteran laying a wreath at the base of a cross at the dedication of the cross ceremony at the Legion Plot in Groveside Cemetery. Behind the veteran laying a wreath are members of the Whitby Citizens' Band. Left of the cross are the Venerable G. Warren, Archdeacon of York Diocese, who dedicated the wooden cross and Reverend E. Ralph Adye, Rector of All Saints' Anglican Church, and Chaplain of Canadian Legion Branch 112. Reverend E. Ralph Adye was Rector of All Saints' Anglican Church from 1930 to 1941. The soldiers' plot at Groveside Cemetery was established in 1933 and the wooden cross was replaced by a stone cross in 1959. 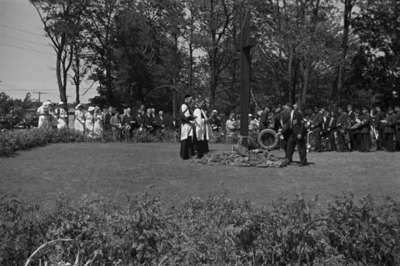 Dedication of cross at Legion Plot in Groveside Cemetery, 1936, Marjorie Ruddy. Whitby Archives 29-004-020.